From The Guardian: A new clean air strategy published by the UK government has been criticised as “hugely disappointing” by the Labour Party. 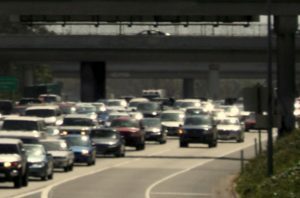 Other groups said it did little to tackle the dirty diesel vehicles that are the main source of toxic air in urban areas. The new clean air strategy is a response to an EU directive on cutting harmful emissions. An air quality plan, published in July 2017, is related to a separate EU directive on cleaner air. The latter plan was condemned as “woefully inadequate” by city leaders and “inexcusable” by doctors, and was ruled illegally poor in February, the third such high court defeat for ministers. 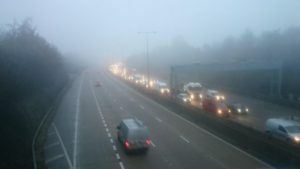 On Thursday, the government suffered another legal blow, with the UK referred to Europe’s highest court over its failure to tackle nitrogen dioxide pollution, which mostly comes from diesel vehicles. In total, 56 per cent of all people aged 60 and over in England lived in an area which breached air quality limits for nitrogen dioxide in 2015. Outside of London, Yorkshire & the Humber had the highest percentage of people aged 60 and over living in areas breaching air quality standards (79 per cent), followed by the North East (72 per cent), North West (67 per cent) and the West Midlands (62 per cent). 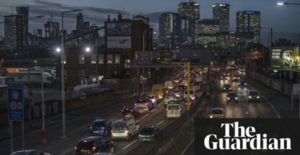 From The Guardian: For the third time, the Tory government has been slammed by the courts for failing to produce an adequate plan to tackle the growing problem of air pollution, in a landmark judgment that will force ministers back to the drawing board in their efforts to clean up dirty urban air. 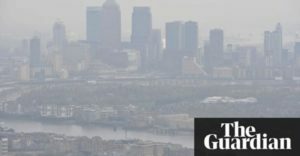 From The Guardian: Air pollution in London has reached the legal limit for the whole of 2018 less than a month into the year, prompting calls for the government to “get a grip and show they’re serious about protecting health”. Toxic air has been at illegal levels in the capital and most urban areas in the UK since 2010 and results in around 40,000 early deaths a year. The date of this year’s reaching of the limit, at Brixton Road in Lambeth, is actually a significant improvement on previous years: for the last decade air pollution has reached illegal levels no later than six days into the year. The improvement is partly the result of action taken by the mayor of London, Sadiq Khan, who introduced cleaner buses on routes through pollution blackspots and charges to deter dirty vehicles from central London. “But I have one hand tied behind my back due to government policies and inaction,” he told the Guardian. Clean air plans put forward by ministers have already twice been declared illegal at the high court for failing to cut air pollution in the “shortest time possible”, as EU law requires. The government is now awaiting the verdict in a third case brought by environmental lawyers ClientEarth, after a hearing earlier in January. From The Independent: More than eight million children live in areas of the UK with illegal levels of air pollution, figures suggest. 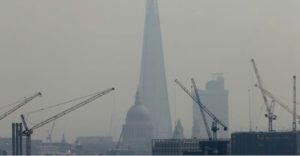 Ibrahim Dogus writes on LabourList: By the eighth day of this year, London had already breached annual air pollution limits set by the EU. 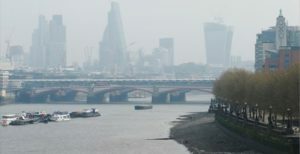 By September, the situation had deteriorated to the extent that mayor Sadiq Khan was forced to trigger a emergency high alert on the capital’s air quality, with warnings displayed in public and those with lung and other problems warned not to engage in strenuous exercise to avoid any health problems. High levels of NO2 can lead towards asthma, heart problems and even cancer. But bad air isn’t just bad for our health. It is a drain on the economy, with six million workdays lost to sickness related to, or exacerbated by, the problem. It has been estimated that illness associated with air quality costs Britain more than £24bn per year – and that is before the additional pressure on our already strained health service is taken into account. Evidence shows that spikes in air pollution may also see a dip in workplace productivity, exacerbating one of the economy’s chronic problems. A better environment, with improved quality of air, would be a boost to the entire economy in addition to our health. From The Independent: The Government spent £365,000 trying unsuccessfully to fight legal claims that its plans for tackling dangerous levels of air pollution were insufficient. Environmental action group ClientEarth successfully argued the UK was breaking the law by not reducing diesel emissions quickly enough. 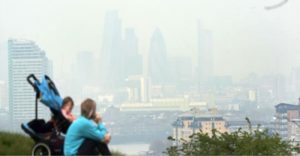 From The Independent: The lives of more than 50,000 people in London alone will be cut short by air pollution by 2030 because the Government’s latest plan to address the problem is so ineffective, the Green Party has claimed. 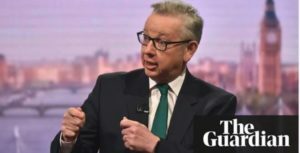 Ministers have a track record of failure on the issue, having twice been ordered by a judge to come up with stronger proposals to bring air quality to within legally binding EU safety limits.